FA:Dave Jones and Gary Gray 5/83. FFA: Mike Anderson and Brian Smoot, 3/07. A quality route. 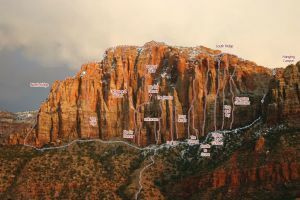 To locate the route, look at the sandy ridge that you walk up for the approach. The sandy ridge is bordered on the left and right by steep drainages. At the top of the west drainage is a large round detached boulder at the base of the mountain. The original line starts in crack hidden in the cave behind that boulder and continues up a gradually widening splitter. The original start requires aid and several pins. The free variation begins in the first corner system left of the large boulder and climbs that corner for most of three pitches before traversing right back into the Silmaril. Some of the hardest free moves on the route are on Pitch 1. Don’t expect to find much fixed gear on this one. Rack: 2 ea to 4.5”, 1 ea 5”, 1-2 ea 5.5-6”, 1 ea extra .5-1.25”, 2 ea extra 1.5-1.75”, 3 ea extra 2”, 1 extra 2.5”- 3.5” note: this rack is for a free attempt on the route, not for the original aid pitches. Descent: descend the south ridge (see North Ridge route description). Which SuperTopo guidebooks include a topo for The Silmaril?